Do you need to keep the room cool, but can’t bear the noise of your air-con unit? Maybe you’re constantly battling between the right temperature and a room that you can actually sleep in? Air-con is a necessary evil for many of us, but who wants to share the room with a reversing truck? We’ve explored the quietest portable air conditioners, so that you can enjoy a comfortable temperature without the tinnitus. If you’re looking for an air-con unit that you might need to carry from room to room, then you’ve come to the right place. Portable air conditioning units are generally cheaper to run than full-home systems because you’re only cooling a single room at a time. They’re simple to install and are usually operational with a couple of minutes, requiring little in the way of set-up. Use this table to quickly compare models or keep scrolling to see each review in more detail. This air conditioning unit has a wide selection of functions, including cooling, dehumidifying and heating, so is an excellent all-year-round solution. The window installation kit is really easy to use, and simple to move around the house. It comes with a washable air filter, as well as an activated carbon filter that draws bad smells out of the room, including smoke and animal odors. The dehumidifier function removes up to 76 pints of moisture from the air per day, and with the auto-evaporation feature, you shouldn’t need to empty the unit. The dual hose exhaust system takes care of the internal air pressure, so the room is comfortable and at the right temperature. When comparing the Whynter model directly to the others on noise level vs power (see comparison graphs below) the Whynter unit and the Emerson unit are clearly in the lead. AWARD WINNING : 1. Good Housekeeping's "Best Portable Air Conditioners to Buy in 2019" 2. 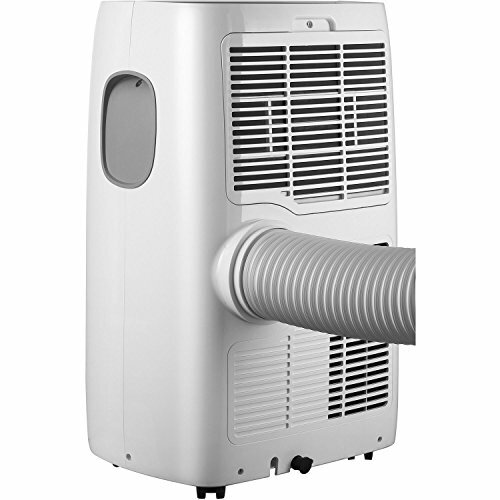 The New York Times Wirecutter named "the most efficient and fastest cooling portable AC"
Full installation set includes extendable exhaust and intake hose (up to 60") and window kit (up to 46") Max. window kit length = 46" , Min. window kit length = 20". For those of you that like graphs, we have a couple here that help you compare how each model compares when it comes to cooling power vs noise level. This first graph shows us the noise level of each model vs its advertised cooling capacity. Now I mention “advertised” specifically here because some of the models do remarkably well in rooms much larger than their advertised cooling capacity. The two stand out models in this comparison are the Emerson Quiet Kool and the Whynter ARC-122DS. Both are more quiet than the other 3 models and still have a decent cooling capacity. Our second graph compares the BTU rating of each model against the noise level. We go into it a little later on in the article, but BTU is a measurement of how much heat each air conditioner can remove from the air. Our observations from this graph once again point to the Emerson and the Whynter units as being standout performers – each of them matching the other 3 units on BTU rating while being much quieter. BTU…what? Read our article on What is BTU? LG Electronics are a well-known name in the home electrical appliances world, with a good reputation for quality. This 8000 BTU unit connects directly to a 115-volt socket and can cool a room of up to 200sq ft. The dehumidifier can draw up to 2 pints of moisture out of the room per hour, so this is a good piece of kit for drying out a room that’s prone to mold. The LED display on the top face of the machine provides a clear temperature indicator, providing two fan- and two cooling speeds. 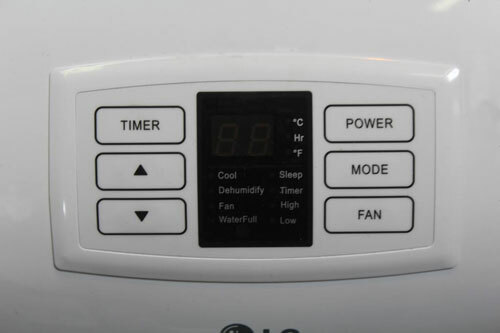 The screen also includes a “water full” indicator to let you know that the condenser water collector requires emptying. The digital display allows you to set your desired temperature (in ºF or ºC) with a timer, allowing you to set the unit to run at specific times. This model includes a drain bucket that collects moisture but has a decent capacity to ensure that you’re not continually emptying it. In a hot environment, it takes around 10-15 minutes for the unit to bring the room heat down to your desired temperature. The LP0814WNR sits on casters that make moving the unit from one room to another easy. It’s a reasonably hefty piece of kit (at 47.6 pounds), so the casters are a useful feature. The unit has a 1-year warranty, covering parts and labor. The pack comes bundled with the air discharge tube, power cord holder, infra-red remote control, bottom drain port, air filter, and a hose and defuser. The LP0814WNR is 11.8 x 13.9 x 29.8 inches (WxDxH). It should fit underneath a standard height table or desk. 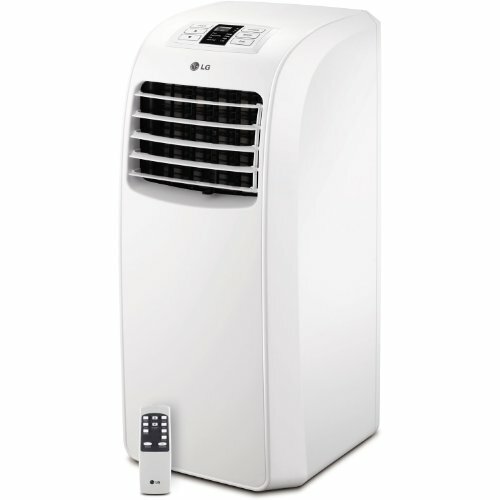 A great unit from LG that is let down by the lack of an economy mode. 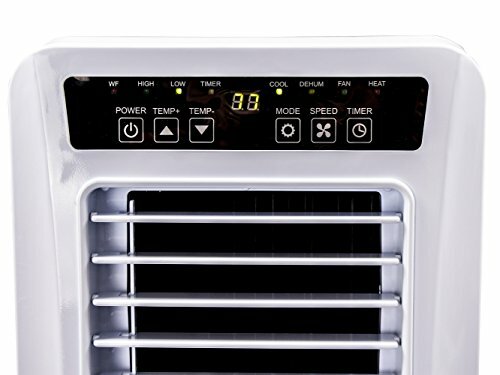 Price: Check local price on Amazon Perfect for: Staying in control over the temperature whether you need it cool or warm. The Whynter ARC-122DS is an excellent solution to maintaining a comfortable temperature all year round; with a heater function, cooling, and air circulation with the 3-speed fan. It’s easy to install and comes with a window-installation kit. The double-hose system helps to negate negative air-pressure which allows even cooling around the whole space. The washable pre-filter comes with an included activated carbon filter which extracts smoke and odors from the room. The window installation kit includes a resizable slider that will adapt to the width of your window, pumping the hot air out of the room so that it can be replaced with cooled air at your specified temperature. The window installation kit includes holes for two pipes – one to extract the hot air, and one to draw in air from the outside to maintain the air pressure in the room. The window kit is straightforward to install and can be moved from one part of the house to another in seconds. A super silent air conditioner that cools the room quick smart. This Emerson air conditioning unit is perfect for a smaller room and is capable of controlling the temperature from between 62ºF and 86ºF. The included window venting kit makes this a simple installation that can be moved around the house or office so that you are cooling just one room at a time. This is one of the smaller units featured in this article, standing at just 28 inches in height. The omnidirectional wheels make moving the EAPC12RD1 around the house a breeze. It also has built-in side-handles which make lifting the unit easy. At 58 pounds, this is a relatively heavy unit (as a comparison, 58 pounds is twice as heavy as a gold bar, and three tenths as heavy as a kangaroo). The auto-evaporation function dehumidifies the moisture from the air while sending that humidity through the exhaust pipe, rather than collecting it in a storage tank which needs to be regularly emptied. This unit comes with a 1-2-5 warranty – that’s 1-year labor, 2-years parts, and 5-years compressor cover. This unit operates at just 53 dbA, which is among the quietest of the products featured in this article. Although EAPC12RD1 offers 12000 BTU, this air con unit is recommended for rooms of just 250sq ft.
A very powerful portable aircon that is too often overlooked. 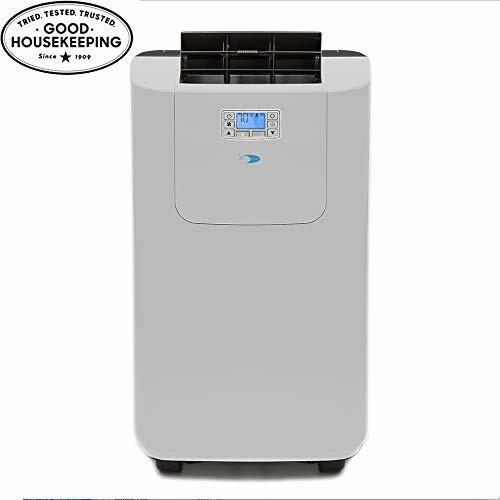 Price: Check local price on Amazon Perfect for: Keeping a room of up to 550sq ft cool and comfortable, convenient auto-evaporation system draws the moisture from the air, with no bucket to empty. 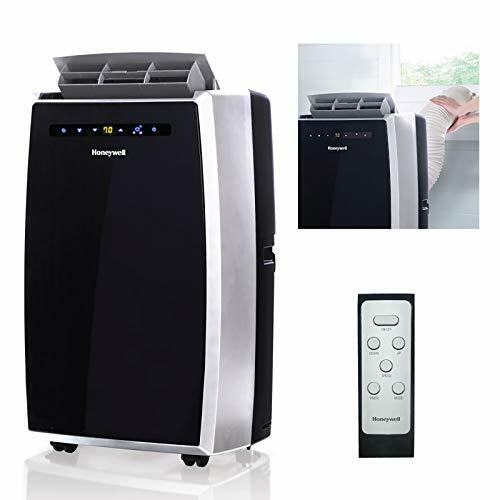 The Honeywell MN12CES is a portable air conditioner with a convenient auto-evaporation feature that means you’re not continually emptying a moisture condenser bucket. With 3-speeds and a timer this product offers powerful temperature control, and quiet operation at just 55dbA. The MN12CES has a sleek appearance with a stylish black frontage, and a silver panel hugging the sides of the unit. 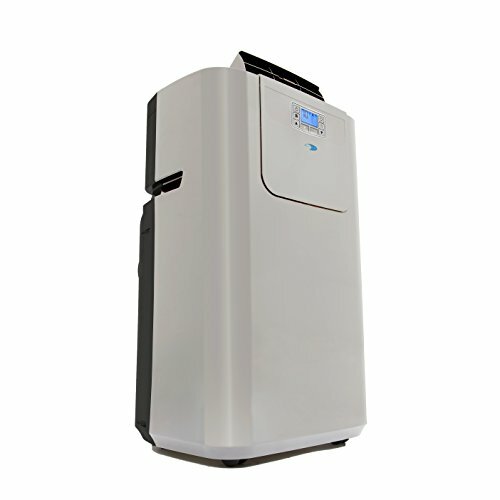 It can both cool and dehumidify, as well as operate as a traditional 3-speed fan. The infra-red remote control allows you to operate all of the functions of the base unit from across the room. Portable air con units are cheaper to run than “entire home” installations, as you can just cool the room that you’re in at the time. The easy-glide wheels mean that you can move this from the bedroom to the living room, and is perfect for the office or for use in an apartment. The unit comes with everything you’ll need to get started, including a window-installation set that allows you to place the exhaust hose in a semi-permanent position. The window-kit can be removed when the unit is not required. The window-kit is easy to install and comes with an adjustable bracket which fits windows between 19.9 to 47.25 inches in width. The cooling unit is controlled with an R410A refrigerant, which includes a handy Auto-Evaporation System – there is no bucket required. The fan mode keeps the air circulating around the room when air con is not required, while the washable air filter catches dust particles so that you’re breathing the freshest air possible. This unit has a 1-year, limited warranty. 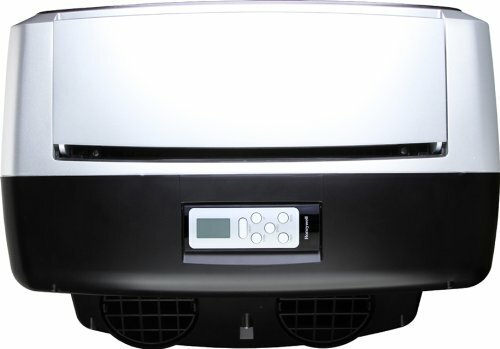 This North Storm Portable AC unit is a great all-rounder, with the ability to cool down a hot room, and heat up a cold one, providing a great all-year-round, one-stop solution. The AC unit offers 12000 BTU which is plenty to heat or cool a room of up to 500sq ft. The unit is self-draining and capable of being permanently installed for continuous usage. When heating, the unit provides up to 50% more heat than you get with a stand-alone electrically-powered space heater. This AC unit, like the others featured in this article, sits on wheels which makes it simple to move it from one room to another. However, it can be installed on a semi-permanent basis in a single place, using the window-conversion kit that’s included in the bundle. The exhaust hose is 59 inches long, and the window-kit fits a window of up to 50 inches in width. The remote control provides complete functionality from the comfort of your armchair. The unit is controlled via a push-button panel which provides temperature-accurate control over the cooling or heating functions, or can merely circulate the air around the room with the 3-speed fan control. 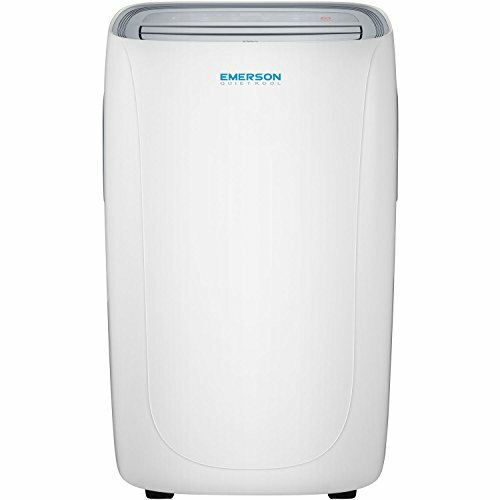 A great little unit that is super versatile, unfotunately it struggles on really hot days. We look for air-con units that operate at around 50dbA. If a jet taking-off is 150db, with the decibel effect of eardrum rupture (bad! ), then 50db is the equivalent of the sound of a quiet suburb, a conversation at home, or a large electrical transformer at 100 feet. BTU is an abbreviation of “British Thermal Unit” and is a unit of heat calibrated by the measure of power required to raise 1 pound of water by 1ºF. BTU is widely recognized as a heating unit around the world. Heat is also recognized for its equivalence to energy – measured in joules. 1BTU = 1055 joules. When the BTU measurement is used in relation to Air Conditioners, it is a measurement of how much heat the unit can remove from the air. 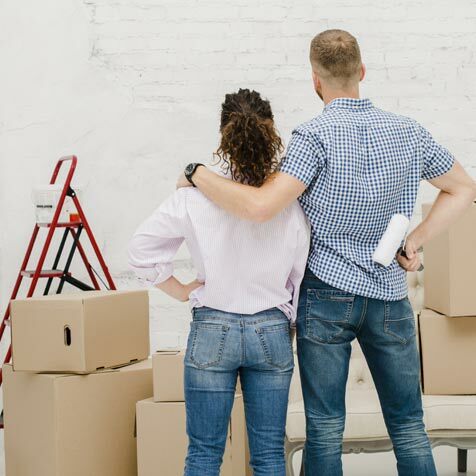 The price of your unit will differ depending on local norms. We aim to provide a clear indication of local price by linking to your local Amazon site. The units featured in this article have been chosen for their portability. Look out for weight, and features that make transportation easier. 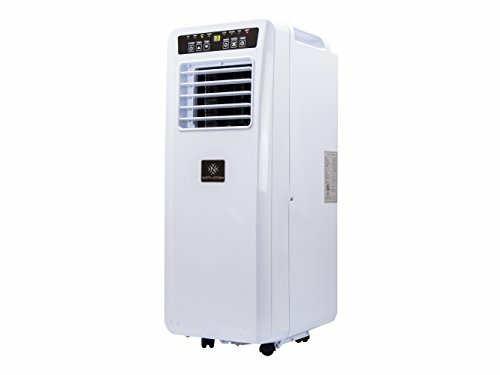 You should expect a portable air conditioning unit to be on easy-glide casters. Many air conditioning units feature a selection of functions that make their use more convenient, such as remote controls, digital displays, climate control (the ability to maintain a specific temperature). Some air con units are heaters as well as coolers – these machines make wonderful year-round solutions. As we already stated numerous times, we really think the front-runners in this pack are the Whynter ARC-122DS and the Emerson Quiet Kool units. Each of these models is quieter than the others listed, and are just as powerful. The Whynter ARC-122DS is available on Amazon here. The Emerson Quiet Kool is available on Amazon here. Of course, it depends on your situation, and what you are after. We recommend looking into numerous different models and making your own choice. Pellet Stoves Vs Propane Heaters – Which Is Right For You?